The Common Raven (Corvus corax) is a large black bird in the crow family, with iridescent feathers. The bill is large and slightly curved. At maturity, it is between 56 and 69 cm (22 to 27 inches) in length, with a wingspan double that. There is a nice selection of colors for the glass eyes. For the section of tree and branch optional gold leafing was selected. An inscription was selected for the horizontal bar and a ‘lucky’ penny of significance was sealed inside the raven’s body in addition to a copper penny from the year the sculpture piece was made. 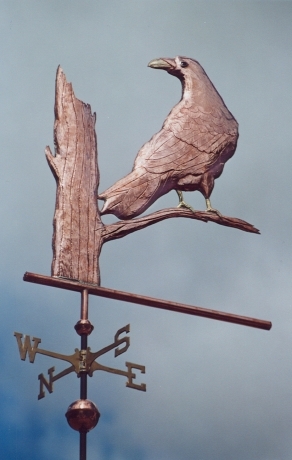 This is a Victorian tradition, and some of the most valuable old weather vanes going up for auction today have the distinctive rattle of a ‘penny dated piece’. 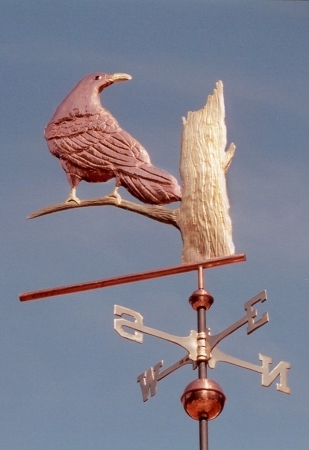 This piece was originally ordered along with a small Hen and Chicks Weathervane, and a Kingfisher Weathervane.